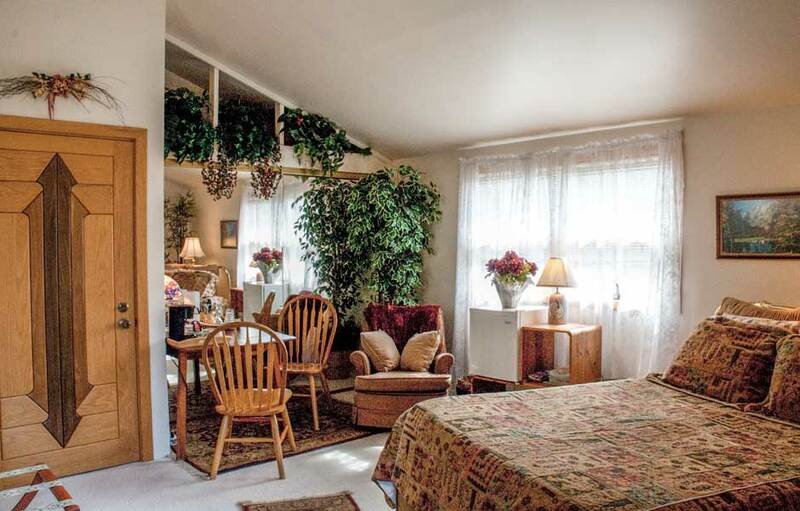 The balcony entrance through lace-curtained French doors sets the mood for this generously sized suite. Snuggle in the bed and watch the stars through the skylight, or sip a glass of wine in the moonlight. 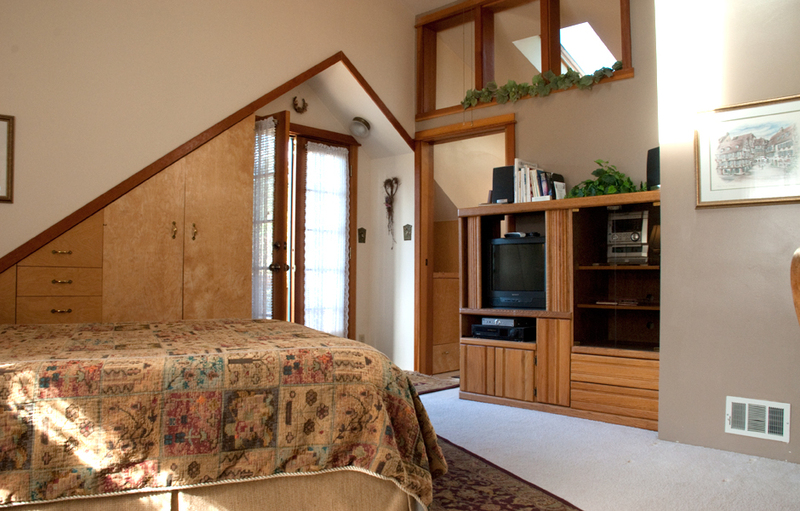 The Casa Blanca style ceiling fan adds to the romantic atmosphere. 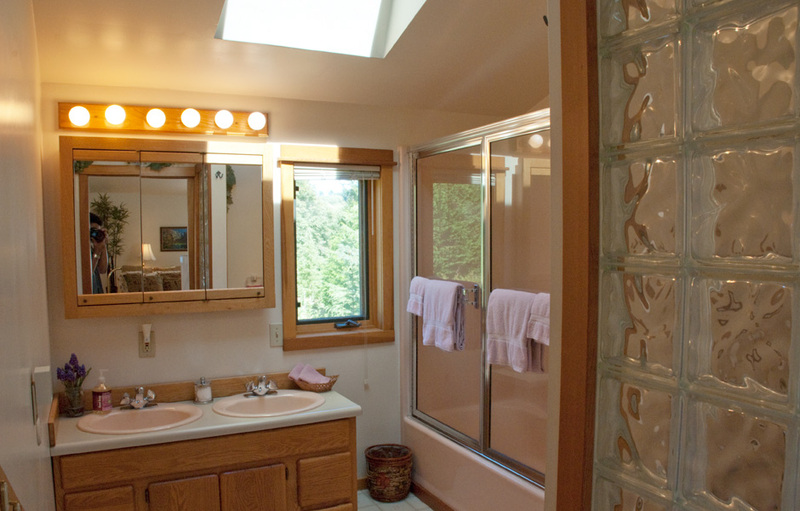 The ample master bath boasts a skylight, tub/shower, and bidet for a European feel. 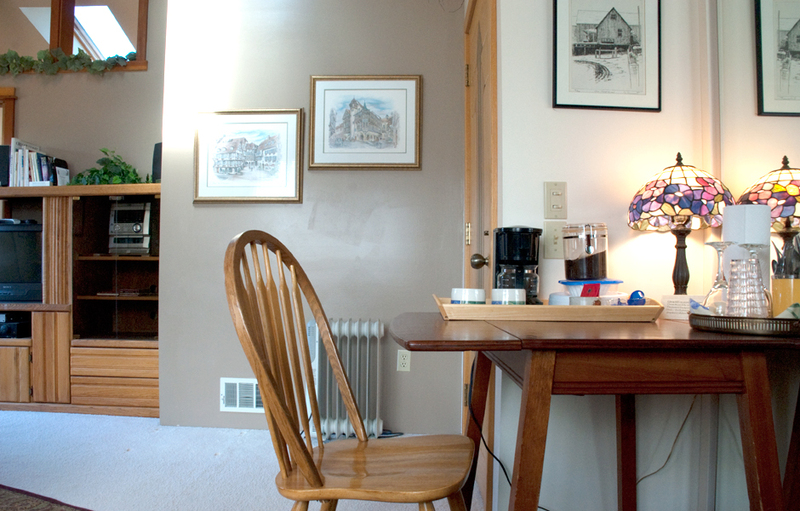 An overstuffed chair in front of the window offers a quiet spot for reading. Soak in the outdoor hot tub or enjoy a movie in the privacy of your room. Also great for personal and artistic retreats and as a wonderful place to unwind after coming ‘home’ after a day of exploring, visiting family, classes or working on the island. 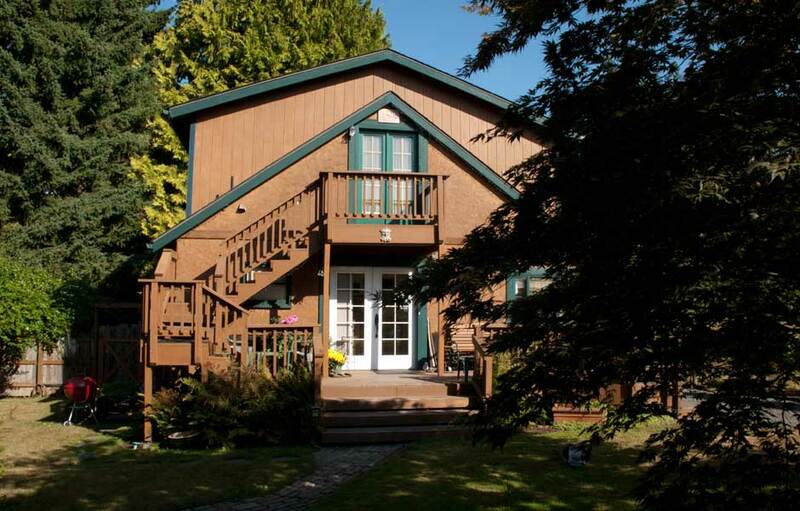 Private entrance, Queen sized bed, skylights, private bath (with tub/shower, toilet, bidet, double sinks, hair dryer, shampoo & soap), small frig, coffee maker, iron/ironing board, robes, wine opener & glasses. $149. – $169. per night + WA tax , 2 – 3 nights minimum stay depending on high season/holiday etc. What a lovely place. Peaceful, inspiring, natural. In a word perfect. Can we live here? Love the garden, the iron work, the beams, the furniture and the stained glass. We are going to take your idea and hang our stained glass in our window too. We will see you again and bring family from here and England too. They will all love it. How could anyone not? Thank you, so much, for your wonderful hospitality. The plum and apricot treats at breakfast were delicious. Your house, guest rooms and grounds were all so very charming and beautiful. We loved our 3 days in the Master Suite. Being from San Francisco, the peace and calm we felt while here will make a world of difference this coming week.